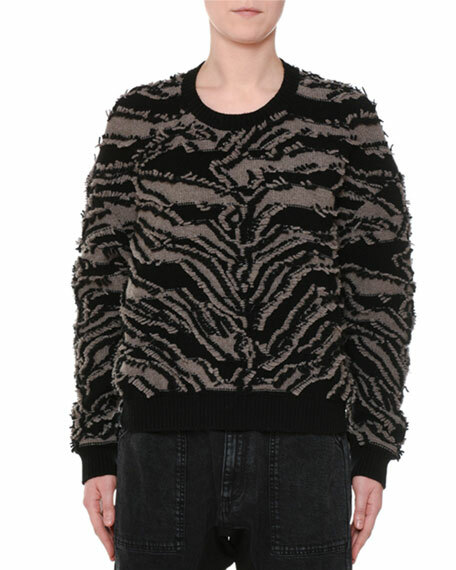 Stella McCartney chunky sweater with clipped fringe. 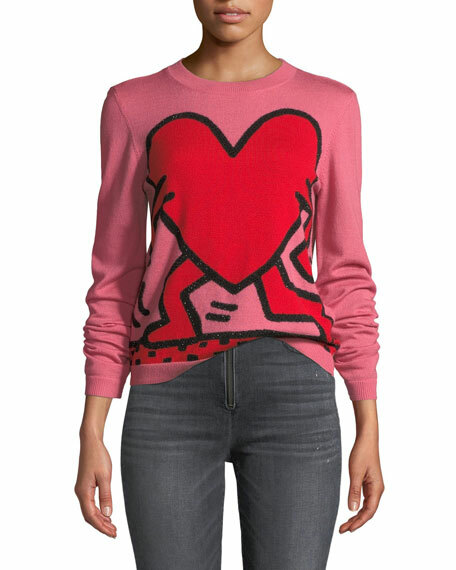 Alice + Olivia "Chia" sweater in intarsia stretch wool knit. Ribbed neck, cuffs, and hem. Crew neckline. Long sleeves. Relaxed fit. Pullover style. Wool/spandex. Dry clean. Imported. 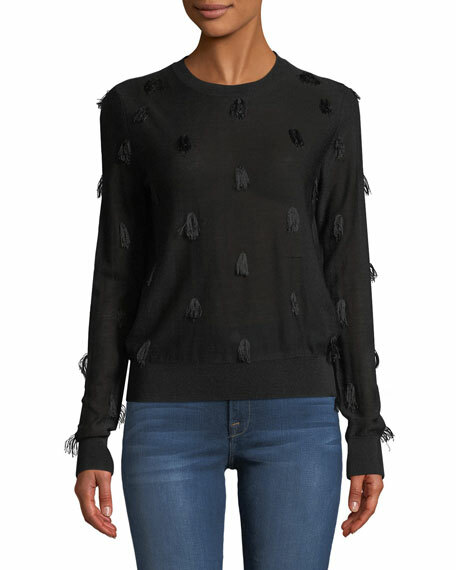 Christian Wijnants sweater with fringe details. Crew neckline. Long sleeves. Slim fit. Pullover style. Virgin wool/viscose. Hand wash cold. Imported of Italian materials. 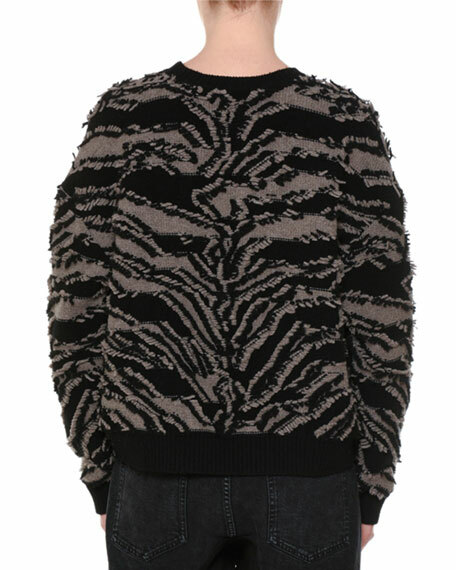 Iro "Version" sweater in mohair-blend. Ribbed neck, cuffs, and hem. Crew neckline. Long sleeves. Relaxed fit. Pullover style. Mohair/nylon/wool. Imported. Model's measurements: Height 5'10"/177cm, bust 33"/84cm, waist 25.6"/65.2cm, hips 35.8"/91cm, dress size US 2-4/FR 34-36. 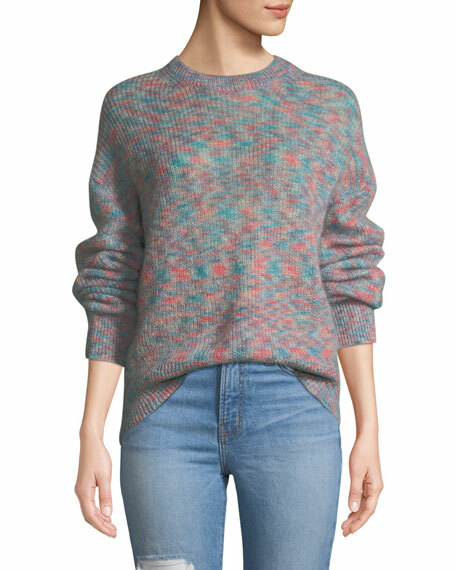 RtA "Rhys" sweater with cable-knit panels. Ribbed neck, cuffs, and hem. Crew neckline. Long sleeves. Relaxed fit. Slightly cropped. Pullover style. Viscose/nylon. Dry clean. Imported.